Musings on Michael Crichton: Who Said It: Carl Sagan or Michael Crichton? Quiz - Who Said It: Carl Sagan or Michael Crichton? Today we're contemplating a verbal battle between two dearly departed authors. In one corner, we have Carl Sagan, the noted astronomer, astrochemist, author, alien hunter and host of TV's "Cosmos." 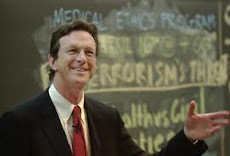 In the other, we have Michael Crichton, the author, producer, physician and lecturer responsible for all those "Jurassic Park" films. Both men loved science and helped popularize it with their work, but they strongly disagreed on issues such as global warming. So which one said the following quotes? It's the creator of "The Andromeda Strain" versus the creator of "Contact." It's trickier than it looks. There are three possible answers so occasionally the correct answer is neither Crichton nor Sagan. I was already an astronomy freak before Cosmos, but Carl Sagan definitely fanned the flames. I was an astronomy major for awhile. I remember Michael Crichton said once that he thought about majoring in astronomy, but he discovered he didn't like long cold nights at observatories.